If budget weren’t a concern, what would you include in your dream home? We’ve gathered ideas from this week’s articles to provide a little inspiration for your fantasies. 1. A grand kitchen. 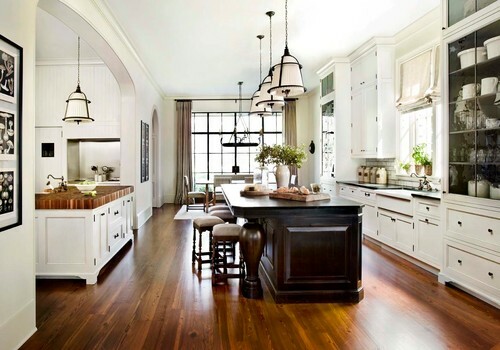 No dream home is complete without a dream kitchen, and this Atlanta space sure fits the bill. Soaring ceilings, plenty of gorgeous cabinetry and hardware, a butcher block island and beadboard walls are just a few standout features to fulfill our fantasy. 2. Double islands. Of course, a grand kitchen should have (at least) two islands. This spacious Canadian kitchen features an island with storage and a sink as well as another island for dining. Oh, and we’ll take one of those dedicated Jack Daniel’s-themed bars while we’re at it. 3. A stylish laundry room. In a dream home, no expense is spared in any space. That was the idea behind this laundry room created by designer Dina Bandman for the 2017 San Francisco Decorator Showcase. The blue-and-white room features hand-painted de Gournay wallpaper, a window treatment from Lee Jofa and porcelain tile flooring from Country Floors. And there’s even a stunning tiled dog wash station. 4. A vintage leather sofa. Apart from durable fabric furniture, a large vintage leather sofa is an entertainer’s dream. This iconic 1970s Non Stop leather sofa from De Sede feels right at home in this Beverly Hills, California, bachelor pad. 5. Outdoor oasis. Let’s move our attention away from indoors and into the great outdoors. Of course our dream home would be in an area with a dream climate that allows outdoor living year-round. This San Francisco outdoor space feature various zones that have it all: a stainless steel grill and pizza oven, an ipe wood deck, a fire pit, lounge seating and a hot tub. 7. A dedicated dressing room. A room of one’s own is a must in any dream home. For some people, that might include a quiet, private space for getting dressed. Here, a former storage space became a stylish, dedicated room for just that. 8. Statement wall in the shower. OK, a little opulence shouldn’t be ruled out. Here, a gorgeous slab of Azul Macaubas quartzite dazzles in a Barcelona, Spain, bathroom. 9. Hand-painted walls. There’s a lot to be said for all the wallpaper options these days. But few things come close to having walls hand-painted in a unique design. In this powder room, an artist created a lovely forest scene. 10. A garage bar. Finally, to me, you can’t call it a dream home unless you’ve got your own bar. Here, two architects converted their garage into a lively entertainment area featuring a quartz bar counter atop painted wood pallets.